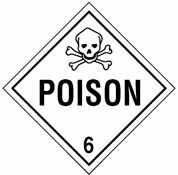 A poison is a substance that adversely affects one's health by causing injury, illness, or death. These are often marked with a skull and crossbones as shown on the right. A substance that counteracts the effects of a poison is called an antidote. In the absence of adequate data on human toxicity, is presumed to be toxic to humans because when tested on laboratory animals it has an LC50 value of not more than 5000 ml/m3 ... LC50 values for mixtures may be determined using the formula in Sec. 173.133(b)(1)(i) of this subpart." Oral Toxicity. A liquid with an LD50 for acute oral toxicity of not more than 500 mg/kg or a solid with an LD50for acute oral toxicity of not more than 200 mg/kg. Dermal Toxicity. A material with an LD50for acute dermal toxicity of not more than 1000 mg/kg. Is an irritating material, with properties similar to tear gas, which causes extreme irritation, especially in confined spaces." "Comprehensive Reviews In Toxicology: For Emergency Clinicians (Hardcover)", Hardcover, 848 pages, 1996. Estimated price $189.95. Info and/or order . "Poisoning and Toxicology Handbook, Fourth Edition", Hardcover, 1,384 pages, 2007. Estimated price $171.22. Info and/or order. "Poisoning & Drug Overdose", Paperback, 736 pages, 2006. Estimated price $56.71. Info and/or order. "Handbook of Small Animal Toxicology and Poisonings", Paperback, 512 pages, 2003. Estimated price $62.95. Info and/or order. "Pick Your Poison: How Our Mad Dash to Chemical Utopia is Making Lab Rats of Us All", Hardcover, 256 pages, 2011. Estimated price $17.13. Info and/or order ILPI recommended. Treat poisonous materials with respect! Read the MSDS sheet to find out what ways a poison can kill you -- is it by inhalation, ingestion and/or skin contact? What precautions should you take with the material? What kinds of personal protective equipment (PPE) are recommended? Remember to read the material label and MSDS if a poison is ingested. For example, it is sometimes bad to induce vomiting because some materials can cause additional chemical burns to the throat and esophagus upon regurgitation. If in doubt, contact the nearest emergency room or call the American Association of Poison Control Centers poisoning emergency number (800) 222-1222. Don't fool around with poisons. Treat them with great respect at all times. Health care workers can be protected from TB, SARS and other bloodborne pathogens with PAPR's from Safety Emporium. Poison Treatment in the Home by the American Academy of Pediatrics. Cyanide Poisoning Treatment Coalition has several on-line articles available without registering, and many more if you do.